Villa Feltrinelli, Lake Garda, Italy. Ranked #4 in our countdown of the 100 Best Hotels and Resorts in the World. Turreted and towered, on the edge of Italy’s immense Lago di Garda, Villa Feltrinelli is a stylish haven with formidable views. 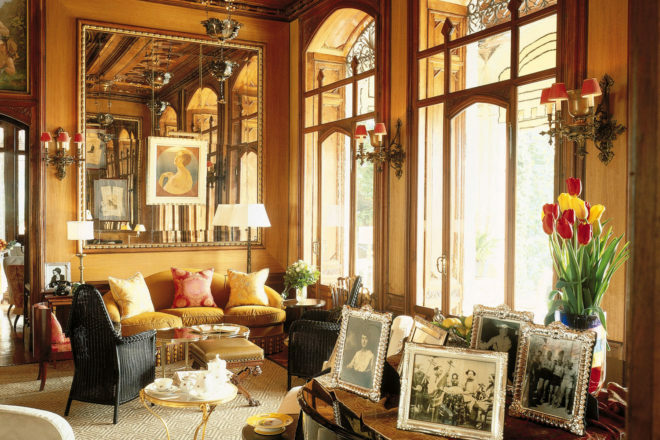 The interiors are polished and supremely comfortable with unexpected flourishes like star-shaped windows, frescoed cherubs and masses of lamps. Seventy pieces of furniture were retained from the early days and matched with over 1000 other antique pieces. There are guest cottages too, with a more contemporary aesthetic. Lavish marble bathrooms come kitted out with satin-lined robes and Acqua di Parma toiletries. The garden is a refuge of oak, towering cypress, topiary and fragrant orange trees. Enjoy an aperitivo in Bob’s Bar, then dine in the romantic pergola overlooking the lake. The Michelin-starred restaurant, helmed by Stefano Baiocco, presents the most delicate and delicious dishes with a side of faultless service. Did you know The Germans occupied the villa during World War II and the exiled dictator Benito Mussolini lived here from 1943–45.